The Delhi High Cour has granted Britannia four weeks’ time to phase out the existing stocks of ‘NutriChoice Digestive Zero’ biscuits with the impugned packaging. 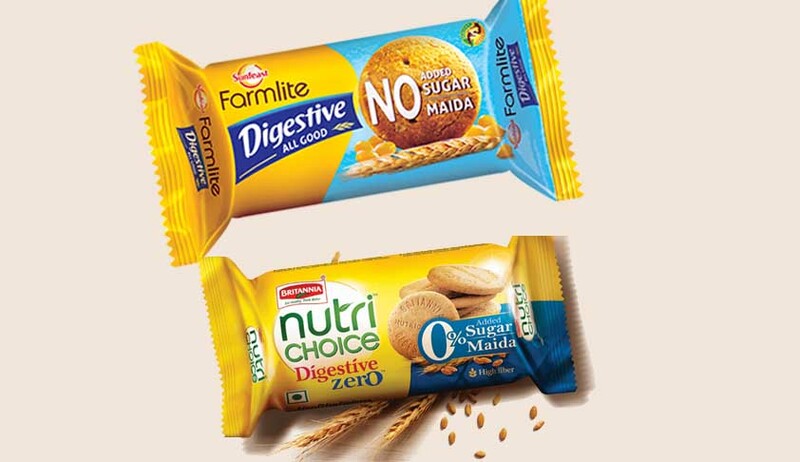 The High Court of Delhi on Tuesday issued a temporary injunction restraining Britannia from using the packaging of ‘Nutri Choice Digestive Zero’ biscuits in its present form, saying it was prima facie “deceptively similar” to the packaging of ITC’s Sunfeast ‘Farmlite Digestive All Good’ biscuits. Justice S. Muralidhar granted Britannia four weeks’ time to phase out the existing stocks of ‘Nutri Choice Digestive Zero’ biscuits with the impugned packaging. It was directed to maintain true accounts of its sales with the impugned packaging from its launch till the date of discontinuance in terms of the order. ITC alleged violation of its rights in the packaging of ‘Sunfeast Farmlite Digestive All Good’ biscuit, with Britannia using a deceptively and confusingly similar trade dress for its ‘Nutri Choice Digestive Zero’ biscuits. It alleged that Britannia had infringed upon the original artistic work in the unique product packaging of ITC under Section 51 of the Copyright Act, 1957. The relief claimed in the suit is for an injunction to restrain Britannia from (a) passing off ITC’s rights in the packaging, (b) diluting the mark, (c) infringing on ITC’s copyright in the same packaging and for delivery, damages and rendition of accounts etc. On the other hand, Britannia pointed to the fact that it has been manufacturing and marketing a range of ‘Nutri Choice Digestive Zero’ biscuits with the predominant yellow color of the product packaging, along with a secondary color since 2008. It claimed to be the market leader with 66 per cent of the market share. At an earlier hearing, Britannia had offered to substitute the blue color in the impugned packaging with dark or navy blue. It refused to change the yellow colour of the packaging, claiming that it was an essential and prominent feature of a range of its digestive biscuits. ITC, however, did not accept the proposal and submitted that the same would be adopted if Britannia agreed to substitute the blue colour with any other color, apart from a shade of blue. Considering the rival submissions, the court observed that it was neither practical nor necessary to establish a formidable reputation for a product, when a new product with a distinctive packaging is introduced in the market. “However, the fact that sales of the said biscuit had picked up to an extent of Rs. 5 crore in a short span of over five months should be an indicator of its growing reputation. Consequently, this court is satisfied that ITC has been able to establish prima facie that its product ‘Sunfeast Farmlite Digestive All Good’ biscuit has acquired a growing reputation in a short span which deserves protection,” the court observed. “The court is, therefore, satisfied that the impugned packaging for ‘NutriChoice Digestive Zero’ biscuits launched by Britannia is deceptively similar to the packaging of ITC’s ‘Sunfeast Farmlite Digestive All Good’ biscuits and such deception is likely to confuse the consumers of such biscuits, even the discerning health conscious ones, into thinking that Britannia’s biscuits are that of ITC’s,” it further stated. As regards the element of damage that could be caused to ITC if Britannia were not injuncted, the court observed that it was possible that Britannia being a 66 per cent market holder, can swing ITC’s customers away, as a result of the deceptive packaging. It further agreed with the contention that since Britannia’s product was not suitable for children due to added sucralose unlike ITC, the deception could lead to a possible dilution of the reputation and goodwill attached to the ITC product. Hence, finding a prima facie case against Britannia, the court issued an order of temporary injunction, taking into account the fact that since Britannia’s product was introduced just about two months back, it was likely to suffer far less damage. It was however clarified that it was open to Britannia to adopt the packaging it uses for the product internationally or while retaining the yellow color, substitute the blue color in the impugned packaging with any other distinctive color other than variants of blue.